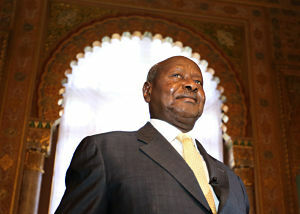 There are no prizes for predicting who wins Uganda's presidential election on 18 February. After 30 years in office and four victorious elections in the last 20 of them, President Yoweri Kaguta Museveni knows every trick in the book. Yet he's still taking no chances. Using state funds, intimidating and outlawing the opposition, and mobilising violent 'youth' are all part of the presidential armoury. All this comes on top of his National Resistance Movement (NRM)'s overwhelming control of the electoral process and its unparalleled ability to mobilise the grassroots. A strong group within the African Union, including AU Commission Chairwoman Nkosazana Dlamini-Zuma, backed the sending of an armed force to Burundi to confront President Pierre Nkurunziza's government. This followed a succession of alarming reports from AU and UN observers. Last week's AU summit debated the merits of armed intervention. It decided against it because of opposition from countries such as South Africa and Tanzania. South Africa and Tanzania led a successful intervention in the east of Congo-Kinshasa but taking on the Burundi army would have made matters still worse in the absence of a political agreement, they concluded. In fact, the AU lacks the tools for the job, even if its leaders can agree on intervention. It is yet to agree on the organisation of a rapid response force and there is confusion about how the African Standby Force and the African Capacity for Immediate Response to Crises will work together. Meanwhile, groups of countries such as Ethiopia, Kenya and Uganda have organised regional forces to intervene in Somalia, and West African states have done the same in Mali. Now, five years after a Western intervention in Libya, European states led by France and Italy are planning another operation. This time, they want to hit the estimated 5,000 fighters loyal to Da’ish ('Islamic State') there. But while the AU struggles with its plans in Burundi and the far worse conflict in South Sudan, it faces being sidelined again in Libya.